2015 Audi Q3 1.4 TFSI review | What Car? The Audi Q3 gets a facelift for 2015 that goes beyond a few visual updates; it adds more equipment, upgrades to the existing engines and one new engine. The new 1.4-litre cylinder-on-demand engine has previously appeared in smaller models in the Audi range, such as the A1 and A3, and shuts off two of its four cylinders when they aren't needed, in a bid to save fuel. The 1.4 is available with either a six-speed manual or the six-speed S-tronic dual-clutch automatic gearbox, and is front-wheel-drive only. If you want Audi's four-wheel-drive quattro system you'll have to look to the bigger 2.0-litre engines. As well as the new engine, the Q3 also gets upgraded equipment levels, including LED or xenon lights as standard, depending on which trim you go for, and the Drive Select system which allows you to alter the steering weight, throttle response and gearbox. The suspension, too, if you've added the auto or £680 adaptive dampers. What is the 2015 Audi Q3 like to drive? The new engine in the Audi Q3 replaces our pick of the petrols in the Q3 range. Thankfully it is well up to the task of taking over from the old 1.4-litre engine, and is fast and flexible enough to cope with overtaking at all speeds. The fuel-saving technology of the cylinder-on-demand system is remarkably unobtrusive. Often the only indication that the engine is operating on two cylinders is a subtle alert on the dashboard - there is no notable change to the noise or the performance of the engine, and it switches seamlessly back to full four-cylinder mode with barely any throttle input. The trouble is, it's not easy to keep the Q3 running in two-cylinder mode, so it will take some effort to make the most of the fuel-saving benefits. Our test car came with the optional dampers, which make the Q3 ride relatively well for a high-set SUV, especially at lower speeds. More bumps make themselves felt in the cabin at higher speeds, but never enough to make the ride truly uncomfortable. Despite this, the Q3 handles well, with plenty of grip and body roll kept in check around corners, giving it something of a hatchback-like driving style. The steering is nicely weighted, but doesn't offer enough feedback to be entertaining. What is the 2015 Audi Q3 like inside? The changes to the inside of the Audi Q3 for 2015 are minimal, and really only noticeable in terms of changes to the equipment. The S line model now comes with a powered tailgate, for example, while all models now get a retractable luggage cover. Otherwise, it is much the same as the pre-facelift car, so you get a cabin which features materials that feel and look great. The overall design is not as modern or stylish as the latest generation of Audis, but the colour screen tucks neatly out of sight and is easy to use, thanks to the large central dial on the dash. 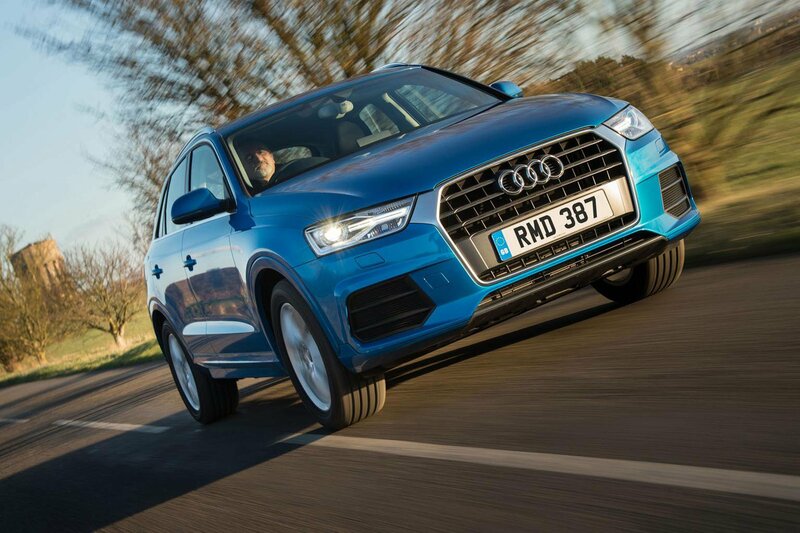 The changes to the Audi Q3 have certainly improved it, and the new 1.4 cylinder-on-demand engine is a great option. Granted, the facelift has also brought a step up in price of around £1500, with this entry-level engine starting from £25,340 in manual SE trim, but the Q3 remains competitively priced next to rivals such as the diesel-only BMW X1. However, if you can sacrifice the premium image, the Q3's closest petrol rivals are options like the Nissan Qashqai and Skoda Yeti, which predictably undercut the Audi by a big margin. Overall, the improvements in fuel economy and CO2 emissions, and the quiet and quick nature of the 1.4-litre engine make this a compelling version of the Q3 - a model that we already rate as one of our favourite small SUVs. It's good enough that most buyers won't need to look higher up the range to the 2.0-litre engine options.